"Distinctions between individual strokeplay and team matchplay cannot be overstated. It is a completely different psychological challenge, to which some are evidently better suited." 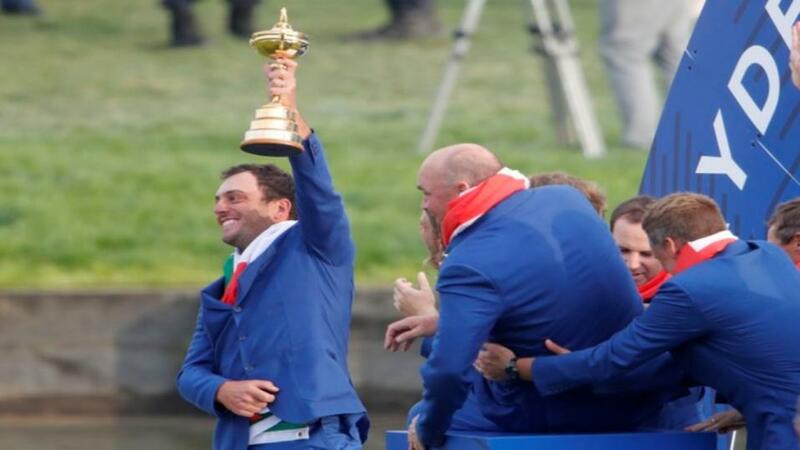 The Ryder Cup is back in Europe after a magnificent team effort. Up against the strongest USA team ever, according to the world rankings, Thomas Bjorn's men completely dominated the weekend. Their 17.5-10.5 winning margin was the highest by either side since Europe won at The K Club in 2006, and the fourth highest overall since the switch to a European side in 1979. Every European contributed a point and there were numerous heroes but Francesco Molinari stands out. The Italian won all five points to finish Top European Scorer and Top Overall Scorer, for which he was trading at around [10.0] and [18.0] pre-tournament. It closes an incredible year for 'Frankie', who won his first major at the Open Championship in July. For the States, Justin Thomas won with four points, having started around [8.0]. It was a superb result for your regular columnist Steve Rawlings, whose four bets included Europe to win and both Molinari and Thomas to top-score. For a blow-by-blow account of an enthralling final day, check out Mike Norman's piece on "How the Ryder Cup was won". I also had a very successful event. My pre-tournament bets yielded over 19 units profit, from backing Thomas at [8.0] and getting a tied place out of Webb Simpson. The in-play plans were also successful. All three bets on Friday won, yielding over 20 units profit. I also backed Europe after the first morning at [3.15] and correct scores to win by five shots or more. Saturday ended on a sour note with a big loss on Europe to win the foursomes (it was tied), but the event ended in the best possible fashion. Alex Noren's long birdie putt on 18 ensured a five-unit profit on Sunday's singles. Overall I made just shy of 32 units in play, making it over 50 for the whole event. As somebody who watches cricket virtually every day, the importance of home advantage and local knowledge is never lost on me. In golf, there is no tournament on earth where they matter more than the Ryder Cup. It is now 25 years since USA won away from home - back in the days where Europe were invariably big underdogs. Although Europe won in the States three times during that period, there can be no question that visiting teams are at a big disadvantage. An extremely noisy, partisan crowd is one problem to overcome. Getting to know the course another. Any captain worth his salt would ensure the course is set up to suit the home team and Thomas Bjorn did precisely that. Every European knew the Le Golf National set-up intimately, whereas barely any of the Americans had any experience of it. Their bombers never came to terms with the emphasis on accuracy and penal rough. With hindsight, they should never have started such hot favourites. World rankings have never been much of a guide to team matchplay golf and, considering they only arrived on Wednesday in the immediate aftermath of the FedEx Cup, this was always going to be a tough gig. Distinctions between individual strokeplay and team matchplay cannot be overstated. It is a completely different psychological challenge, to which some are evidently better suited. Ian Poulter proves that better than anyone - boasting a win ratio over 70% in matchplay whilst never reaching the top echelon in strokeplay. Yet again, The Postman delivered. On the other end of the scale, the two best players of the last 30 years failed, yet again, in a Ryder Cup. Phil Mickelson was awful, in keeping with his recent form. I guess his name alone ensured a wild-card pick but he was never likely to contribute much, especially around this narrow course. Earlier in the week, some were arguing that Tiger's relatively poor record in this event was merely a consequence of being in an underachieving side. Nonsense! The reason the USA under-performed so many times was precisely because they were too reliant on Woods and Mickelson, who failed to lead and underachieved. Their status demanded playing at least four matches, meaning better 'team players' missed out. It has been wonderful to see Tiger back in contention, winning at the very highest level. Long may it continue. But he simply isn't the same person or player in a team environment. Particularly compared to the animated Europeans, Woods cut a miserable figure all weekend, perhaps searching for some inspiration to get his juices flowing. I was chatting to an old mate who loves a golf bet pre-event about trading in-running. His plan was to lay leaders at odds-on, relentlessly. I advised against, on the basis of past experience, and feel stronger about that having spent the weekend considering it. Sure, we do get turnarounds. The first morning saw two, with Rose/Rahm and Woods/Reed both losing having been matched earlier at 1.14 and 1.26 respectively. However in the four subsequent sessions, only one trailer at halfway went on to win (Thomas in singles). In other words, holding your nerve and being prepared to back front-runners at odds-on is the way forward in matchplay. Steve will resume the in-play blog and debrief later this week, when we return to strokeplay golf at the Alfred Dunhill Links Championship. Look out for his preview tomorrow.